The track was believed to be originally cinder. Until 2001 it had a concrete/asphalt type surface and was 440y in length with 6 lanes all round and 8 down the home straight. It was is in fair condition and the lines were marked although the inside and outer lanes were slightly overgrown. All the runways were of the same surface but were in poor condition. The inside of the 2nd lane and the outside of the 5th one were marked with yellow lines which probably indicated that the inner and outer lanes were not normally used. A diagram of the old track is here. 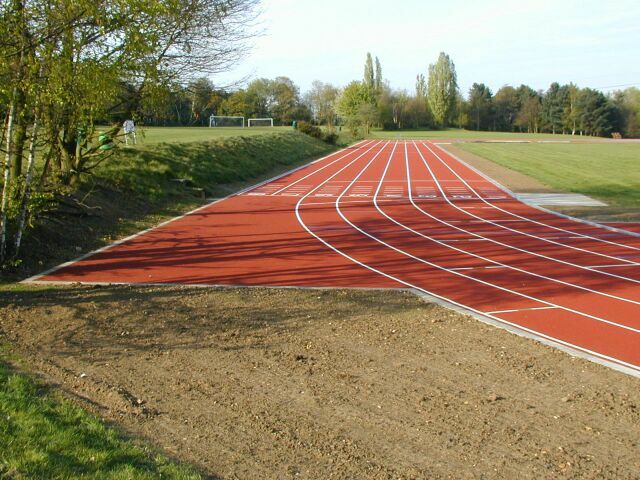 In autumn 2001 work began on upgrading the track to be synthetic and was completed in April 2002.